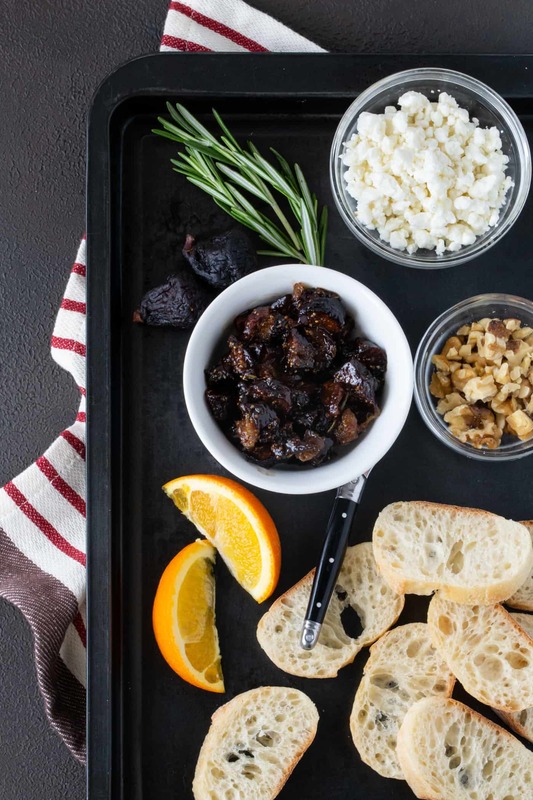 Add some fanciness to your next appetizer spread with these warm-from-the-oven Fig and Goat Cheese Bruschetta! Figs are festive, don’t you think? They scream party to me. So it’s only fitting that the latest addition to our appetizer buffet includes dried mission figs. 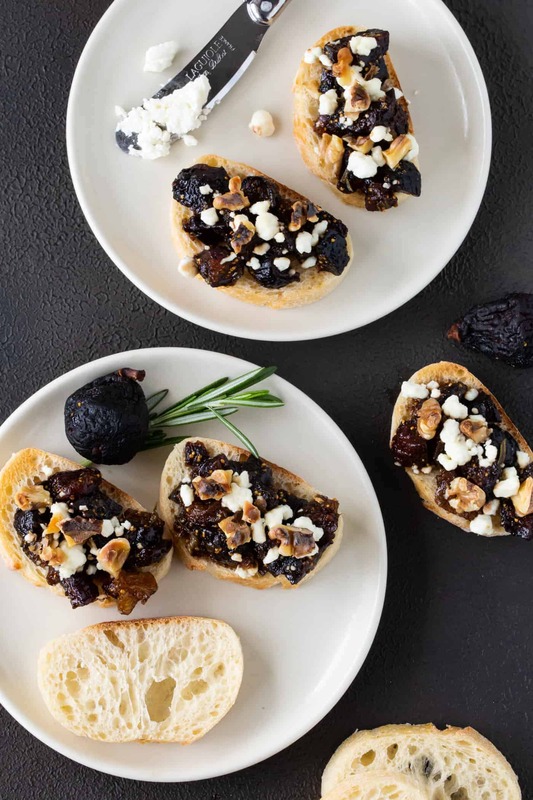 These elegant Fig and Goat Cheese Bruschetta with toasted walnuts can be served warm or at room temperature and are sure to impress your friends and family. Citrus plays a heavy hand in these tasty nibbles. Fresh orange sections, orange rind and orange juice all combine to add brightness and help balance out the sweetness of the figs. Plus a bit of fresh rosemary lends a savory undertone to the fig compote. Layer it all with creamy goat cheese and crunchy walnuts, and you have one memorable mouthful – perfect for entertaining. How do I made this goat cheese bruschetta recipe in advance? The fig jam can be made up to three days ahead of time. Simply refrigerate until ready to assemble the bruschetta. You can also make the fig bruschetta an hour in advance and serve these snacks at room temperature rather than warm from the oven if you are short on time. 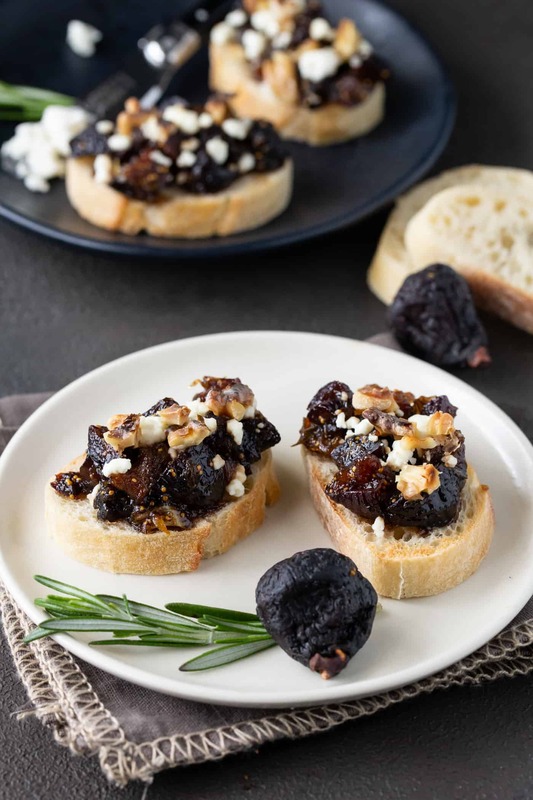 Can you substitute fresh figs for the dried figs in this fig appetizer recipe? To be honest, I don’t have a lot of access to fresh figs here in Minnesota. They are rather hit or miss at the grocery store, and even then they can be rather expensive. That said, I think if you have ready access to fresh figs, by all means swap them in for the dried version. I suspect you’ll need to cook the fig compote down for a longer time but the flavor should still be the same. If you give it a try, please stop back and let us know! P.S. Are you a fig fanatic? Don’t miss our Cheesy Fig Shortbread Crackers recipe! 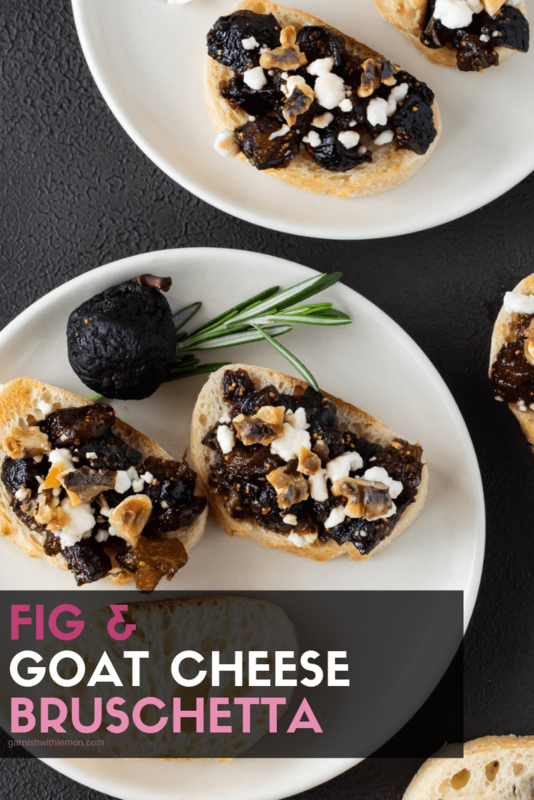 This Fig and Goat Cheese Bruschetta is a festive addition to any appetizer spread! Place figs, sugar, orange segments, rind, juice, rosemary and black pepper in a small saucepan. Stir and bring to a boil. Cover pan and reduce heat. Simmer for 10 minutes. Uncover and cook for another 5 minutes or until fig mixture thickens. Remove from heat and allow to cool. Place baguette slices on a sheet pan. Evenly divide fig mixture and goat cheese on slices. Top with chopped walnuts. Broil for 1-2 minutes or until nuts look toasted. Serve warm or at room temperature. You can easily make the fig mixture in advance. Refrigerate until ready to assemble the Bruschetta. This looks amazing! I’m going to try this weekend! It’s a keeper, Ashley. I hope you love it! Beautiful appetizer Anna! Definitely keeping this around for our next cocktail party. Thanks, Vijay! I think you’ll love these little bites! I only just made the mixture, since I’m doing it ahead of time for a dinner party tomorrow night. My only suggestion would be to chop the figs into fours. When they were cooking, the mixture really wasn’t coming together…so I took a fork and knife and just started slicing while they were in the pot…worked like a charm and tastes delicious!! Perfect fall treat. I am a fig fanatic! I love the flavors of this easy appetizer! These look delicious. Is it really 622 calories per 2 pieces? You’re right, Amy; that was an error. Fixed now. Thanks for catching it!